MTN music plus has last for years most especially the free 150MB given to you back then which with the help of Psiphon and other VPNs you can extend the mbs to power all of your apps for browsing and unlimited downloading. Music plus was then very much helpful to many MTN users back then, that even when you exhaust the 150MB you just have to redo it with little process free of charge, it was indeed very helpful. But right now you can easily get yourself free airtime from MTN music plus, all you have to do is scroll down with us for the full details on how to get it done. >> Firstly, download "Music Plus" by clicking here. >> Get your MTN SimCard that provides you with unlimited downloads via music plus. >> Open Music plus then input your Phone Number and click on send code. >> In few minute, you will receive an SMS with your code input it then tick login. 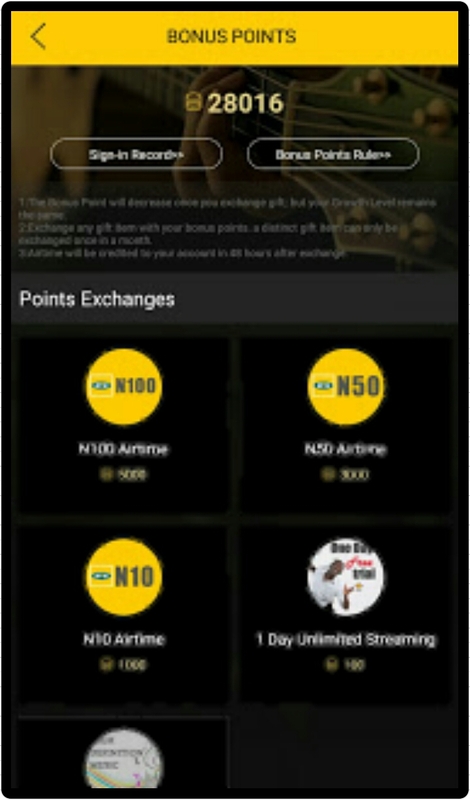 >> Next, you will see your points just click on it a page will open where you can exchange the points for airtime. IMPORTANT: Terms and conditions applies as for the new users, review the page on how to earn points.